A partial lunar eclipse will be visible in Israel on the night of August 7, 2017. The partial phase begins at 8:23PM. Mid-eclipse is at 9:20PM. The eclipse ends at 10:18PM. Since this is a partial eclipse only the southern part of the moon will be covered by the earth's shadow. The top half will remain bright. But the eclipsed southern part of the moon should show a nice ghostly red color. This eclipse is visible everywhere in Israel where the sky is clear. You do not need optical aid to see it, but even binoculars will enhance the view. 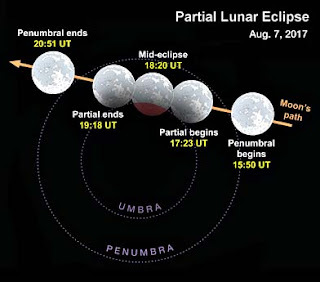 Timings for the partial lunar eclipse of August 7, 2017. Add 3 hours to UT (Universal Time) to get Israel Local Time.